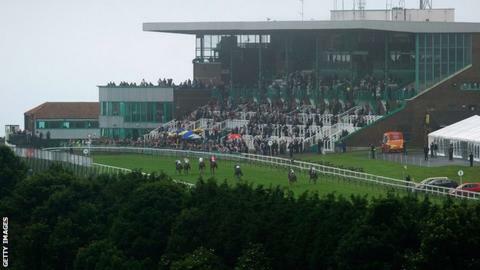 Brighton Racecourse hopes to benefit after being awarded a matinee fixture by the British Horseracing Authority. This week the Sussex venue plays host to the first of six meetings which will be run on consecutive Fridays. Phil Bell from Arena Racing told BBC Sussex: "Racing has still got a huge challenge to get more people through the doors. "It's a bit of an experiment for us to see if we can get a few more race-goers in. It's a great opportunity." The meeting, which will start at 12 noon on Friday and last approximately two and a half hours, forms part of a trial by the BHA to increase betting turnover in the industry. "It's primarily aimed for betting shops," Bell explained. "The BHA would like to encourage people to place bets on English racing when they go into betting shops to put their bets on for races later in the day. "Around lunchtime, some betting shops beam in [TV coverage of] racing from abroad. "We don't benefit from any kick-backs from bets placed on racing from abroad. We do benefit from racing held in the UK." Bell believes that if the trial proves successful then it could build up regular support from race-goers. He added: "In reality, if this took off in the long-term you might have a chance of developing decent attendances. "As an experiment it is new and will take time to bed in, develop and for the general public to realise there is racing that starts so early. "Anything that works in racing needs to have a pattern and be there regularly in the calendar. "The best and most popular race meetings happen every year in the same place. "If matinee racing becomes a permanent addition to the fixture list and a pattern develops, I can see us attracting people."